One of purposes of students’ success in learning English is to be able to communicate in English especially in oral form. Therefore, students need to master Speaking skill. To teach and train students speaking skill involve many aspects and strategies; one of them is the material used in the classroom. 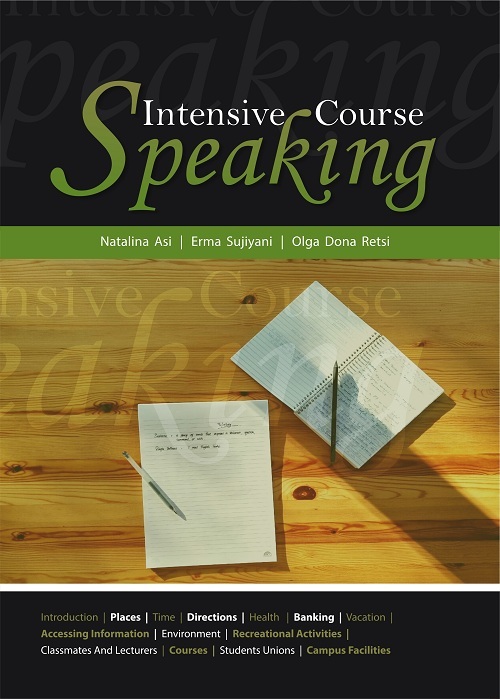 This book, Intensive Course: Speaking Skill is constructed to help students develop their skill in speaking English. The content of this book is organized to simplify the complicated aspects required in speaking. To help students to learn how to speak English fluently, students are introduced and trained with the very basic components in speaking by learning and practicing the pronunciation of vowels and consonants. The topics discussed are based on the most familiar topics of everyday life, incorporating the local content to make students feel in the topics. To enrich students’ vocabulary mastery, each unit of the book is completed with lists of vocabularies to be learned regarding the topics. It is also supported by expressions and key structures that are frequently used related to the topics. The core activities of this book is the situational speaking activities at the end of the unit. This book helps prepare the students by learning the provided dialogues as the examples before they are assigned to practice and conduct their speaking performance. Overall, this book is designed in simple way and the instructions are easy to follow. The writers acknowledge that this book has some imperfections. The writers will always accept any constructive critiques and advice for the betterment of this book in the future. The writers give so many thanks for kind helps from whoever involved during the process of completing this book. Last, the writers hope that this book will benefit the users in learning basic speaking skill in English. Buku Intensive Course Speaking ini diterbitkan oleh Penerbit Buku Pendidikan Deepublish.